Masaccio,(Tommaso di Ser Giovanni di Simone Guidi Cassai) 1401-1428, another of Italy’s famous artists painted one of his famous paintings "The Holy Trinity including the figures St. John, the Virgin Mary and Two Donors", in 1425. Influenced by Burnelleschi and one point scientific art perspective, for the first time in art history there is an example of three-dimensional picture space. He pictorially created depth and recession into a flat surface with one point perspective. To understand his one point perspective; draw a line along the top edges of both Ionic capitals and continue down at a diagonal until each intersect each other. Where they meet is called the "point". In the artwork “The Holy Trinity” the lines meet behind the dirt mound at the foot of the cross. Creating perspective depth means all linear orthogonal edges or lines must converge at this one point. The orthogonal lines and edges in the ceiling follow this perspective also. Tommaso became a master of art perspective. His paintings and frescoes had the feeling of monumental grandeur that Giotto's large-scale frescoes had. His figures were heavy, simple, and rounded, draped with massive naturalistic cloth. The figures took on volume within space using chiaroscuro, (light and shadow) moving away from the sharp linear edges of Byzantine art and early Gothic painting. His later works were broadly painted with no great attention paid to detail as Gentile da Fabriano. Masaccio for instance would not paint each hair on a head, but a mass representing the whole of the hair, somewhat as the Impressionists represented objects in their later works of art . He painted figures moving through three-dimensional space, emotionally interacting with each other at eye level in one of art history’s famous paintings "The Expulsion from Paradise", 1427. Masaccio had great use of foreshortening increasing the believability that his figures existed and interacted in space. His strict art compositions with a pyramidal ordering of the central figures, is a system that would later be used by artists in the High Renaissance. Other famous artists of the Gothic art period are Cimabue Piero della Francesca. 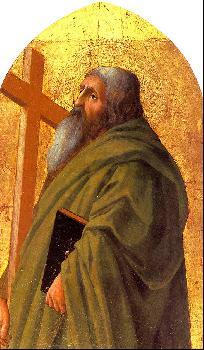 To view the entire gallery of Masaccio, click here.